The weekend before Thanksgiving, when we went to Whole Foods to buy a turkey and pumpkins and Brussels sprouts and such, we stopped by the meat counter to pick up an item or two for meals before the big feast. Naturally, while I was considering quick cooking items like ground meat and veal scalloppine, Jeremy the perpetual lamb fiend pointed out the leg and shoulder roasts. I wasn’t about to cook a big roast three days before Thanksgiving, and counter-offered with lamb stew. Eventually, we settled on getting a shoulder roast to make shepherd’s pie. Even though shepherd’s pie is frequently made from leftover lamb roasts or stews, we decided to make it fresh, thanks to Gordon Ramsay. 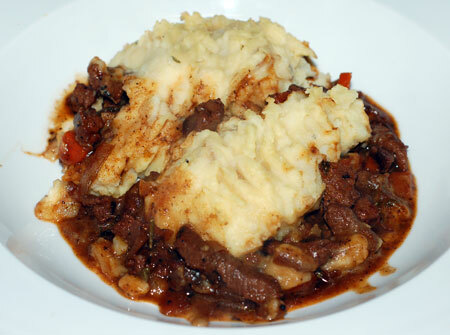 (The previous week’s episode of Kitchen Nightmares showed Gordon making his own “family recipe” for shepherd’s pie as the new signature dish of a failing restaurant.) So I ended up tracking down a Gordon Ramsay recipe for shepherd’s pie to use myself. Of course, for over a week, the plan was put aside, because Jeremy came down with stomach flu and was barely to eat anything but chicken noodle soup for several days before Thanksgiving. The lamb shoulder went in the freezer and stayed there until our leftovers dwindled a week later. This recipe turned out to be a rather time-consuming one, but that was my fault in part, because I decided to mince the lamb by hand, instead of using my grinder. It was a fatty cut of meat, and there was quite a bit of additional chopping, sauteeing, reducing, mashing and mincing. 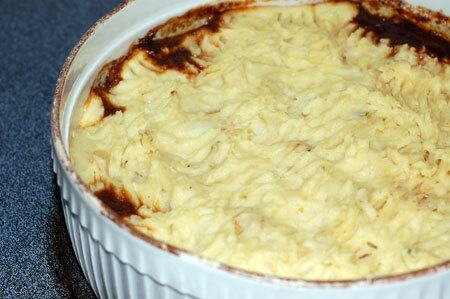 I was at least able to use up the last of the leftover mashed potatoes from Thanksgiving as a portion of the topping. All in all, it was at least two hours in the making, and while certainly a tasty shepherd’s pie, I have to admit I like the ones I make from leftovers just as well. Of course that would mean doing a braise or roast the day before, so it was going to be a bit of a project either way. Preheat oven to 350F. Heat 2 T olive oil in a large pan until hot. Season the mince and fry in the oil over moderate to high heat for 2-3 minutes. Stir the onions and carrot into the mince, then the garlic. Add the Worcestershire sauce, tomato paste and herbs and cook for 1-2 minutes, stirring constantly. Pour in the red wine and reduce until almost completely evaporated. Add the chicken stock, bring to the boil and simmer until the sauce becomes thick and glossy. Check for seasoning. Meanwhile, cook the potatoes in boiling salted water until tender. Drain, then return to the hot pan over low heat to dry out briefly. Pass them through a potato ricer, then beat in the egg yolks, followed by about 2 tbsp grated Parmesan and seasoning with salt and white pepper. Spoon the mince into the bottom of a large ovenproof dish. Using a large spoon, pile the mashed potato generously on top of the mince, and spread out gently, starting from the middle and working your way to the edges. Grate some extra Parmesan over and season; fluff up the mash potato with a fork to make rough peaks. Place in a preheated oven at 350F for 20-30 minutes or until bubbling and golden brown in color. Serve with pan-roasted carrots. Source: Slightly adapted from Gordon Ramsay.